Sure you can add inspirational wall decorations for dorms to your dorm room decor, but why settle for something with one quote on it when you can have dorm room decorations that are filled with inspirational quotes! This cool poster for dorm rooms is filled with plenty of inspirational quotes so you can read your dorm room decorations when you're feeling down or having a tough day in college. Having a bunch of inspirational quotes in your wall decorations for dorms is pretty cool in the first place. 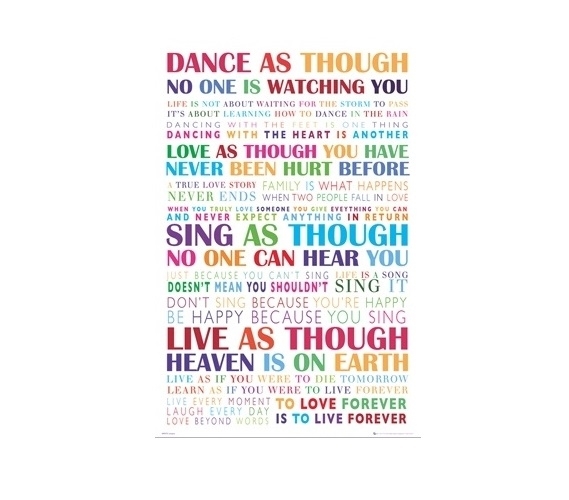 However, this college poster has more than that - all of the quotes are in different styles and different colors to add even more style to your dorm room decor! There are going to be stressful days in college and tough days in college. It's inevitable, unfortunately. With the right college supplies in your dorm essentials, you can get through those days like a pro. Make your college dorm room as comfortable as can be with dorm essentials that remind you of home and remind you why you're in college. You're following your dreams, but sometimes that can be hard when you're frustrated with a college class or a little homesick. Our Dance Dorm Room Poster will add inspirational quotes to get you through those times and it will also add bright, cheerful color and style to your college wall decor!